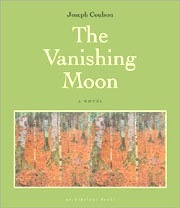 John Reed (Editor-at-large): I’ve been reading The Vanishing Moon, a novel by Joseph Coulson (Archipelago Books). It chronicles the American family with enormous intensity. His sense of history is vast, his sense of detail fine, Coulson is the ferryman to that America just beyond tragic and wondrous. Nelly Reifler’s collection of stories, See Through (Simon & Schuster), is as dark and delightful as chocolate truffles. You’ll enjoy them, and feel guilty for it. And, she’s a Brooklyn native. And I recommend Natural Trouble, a collection of poems by Scott Hightower (Fordham Press). Tough-minded and elegant, Hightower is a singular balance of poetic tradition and poetic revolution. Hightower, in his second book, effortlessly demonstrates a compassion and wisdom that commands the attention of his readers.